Santa Claus, clad in a fake beard and wearing the kind of protective eyewear often used at a shooting range, produced a 9mm handgun and indiscriminately opened fire on the Christmas celebration, according to search warrants unsealed in Pomona Superior Court this week. An autopsy of Bruce Pardo revealed he was high on cocaine when he shot and killed nine people on Christmas Eve. Pardo tested positive for cocaine in toxicology reports of his blood and urine, according to a recently released autopsy report by the Los Angles County Department of Coroner. On Christmas Eve, Pardo , dressed as Santa Claus, shot and killed his ex-wife Sylvia Pardo , her parents Joseph and Alicia Ortega and six other family members. He then torched the Knollcrest Drive home where the victims had gathered for an annual holiday celebration. Pardo later shot himself to death inside his brother’s home in Sylmar. COVINA – The police department announced funeral arrangements for nine members of the Ortega family who were killed during the Christmas Massacre. A prayer vigil is set for 7 to 9 p.m. Thursday at the Holy Name of Mary Catholic Church, 724 E. Bonita Avenue in San Dimas. Friday, a funeral mass will be held from 10 a.m. to noon at the Holy Name of Mary Catholic Church. It will be followed by a procession to the grave site at Forest Law Memorial Park, 21300 Via Verde in Covina. Following the burial , a reception is planned for 2 p.m. at the Sacred Heart Catholic Church, 344 W. Workman Avenue in Covina. Nine members of the family were killed on Christmas Eve when Bruce Pardo dressed as Santa Claus burst into their holiday party and opened fire. Pardo, whose ex-wife and in-laws were at the party, then sprayed fuel into the house, setting it on fire. Pardo, who was badly burned in the attack, later killed himself. 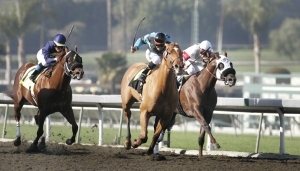 I’ve been to lots of events at Santa Anita through the years. None was as emotional as Thursday’s second race, which featured Return of the King, a scrappy 7-year-old chestnut gelding with Martin Pedroza aboard. The connections, Pedroza, trainer David Bernstein and family and friends who filled in for deceased owners Joseph, James and Charles Ortega, saw their horse glide to a come-from-behind victory. They shed tears of joy and sadness. Jockey Martin Pedroza told me he thought he was guided by angels throughout the race. Jockey Danny Sorenson told me that despite the competitive nature of the racing business, most of his peers wanted to see Pedroza win. ARCADIA – Tears freely flowed Thursday at Santa Anita when Return of the King stepped into the Winner’s Circle. Friends and family members of Joseph, James and Charles Ortega had come to see their seven-year-old chestnut gelding race for perhaps the last time from the barn of trainer David Bernstein. The three Ortegas were among nine family members slain at a Covina home on Christmas Eve by Bruce Pardo, the estranged husband of Joseph’s daughter Sylvia.